2 Comments Published by Terrace Crawford on 9/28/11 at 7:34 AM. I've done some research and have been having lots of conversations with youth workers on a growing phenomenon known as "Extended Adolescence." One of the people that I love hearing from on this topic (who has done much more research than I) is my friend, Mark Oestreicher (Marko). Recently Marko's new start-up (the Youth Cartel) announced that he was hosting a symposium on the heels of the National Youth Worker's Convention this year in Atlanta and he's invited a few leading experts to share on this important subject matter. But perhaps the biggest shift in American adolescence is the duration. Adolescence is now, on average, an almost 20-year trek, lasting all the way through the 20s. Of course, there are 20somethings who are fully living as adults long before they reach the ‘used to be the marker of entering middle age’: 30. But then, there are plenty of young 30somethings still living in an extended adolescence. What impact does extended adolescence have on the faith formation of teenagers? Ok, a second question: How should we respond? [Go here] for the rest of the article. Have you tried LIVE Curriculum? 0 Comments Published by Terrace Crawford on 9/27/11 at 7:42 AM. Last week I had a chance to sit down with a couple youth workers and talk about curriculum. I encouraged them to check out Simply's LIVE curriculum, one of the best available to youth workers in my opinion. Check out this quick video about LIVE and if you're interested you should give my friend Matty McCage a call. You might tell him I sent you (and use these code words) for some rewards! 1 Comments Published by Terrace Crawford on 9/22/11 at 4:09 PM. Join me in prayer for today's teenagers and share this with your ministry leaders. 1 Comments Published by Terrace Crawford on 9/15/11 at 7:30 PM. The "Youth Ministry Garage" debuted today featuring Doug Fields, Josh Griffin, Matt McGill and Katie Edwards... live from Doug Fields' garage. I encourage you to check out the new site and the first episode. I'm including a screen shot of the site and their slick intro video. 2 Comments Published by Terrace Crawford on at 2:32 PM. A few weeks ago I asked a youth worker out to lunch. We met, had lunch, and talked about our ministries together. In a very short time I noticed a pattern. God seemed to be leading us to teach on some of the very same topics and address some of the same issues in our respective ministries. Over the last couple of weeks I’ve been working on my upcoming teaching series to help students to take their faith public and began to think about how I wanted to brand the series and roll it out to our students. Enter the youth worker I had lunch with. He also had been working on a teaching series to help students take their faith public and just a few days ago branded the series and presented it to his student ministry. Immediately the thing took off. Students overwhelmingly embraced it and it looks like a movement has started. I was in awe of the response of his students and how God has started using his teaching. It was good. Very good, in fact. So good that I had to come up with something different. It was a tall order though… because I had to work harder to create something bigger and better than he did. I started to really wrestle with this. Why did I have to create something different? Something better? Why can’t I just join the movement instead of creating a new one? So that is exactly what I did. I tried to overcome my jealously… my drive…my pride… and I picked up the phone and called this youth worker. I told him how great of an idea he had. I told him how awesome it was (and also how obvious it was) that God has started a movement. Then I asked to join him. I asked, “Why can’t we collaborate and do something really big here?” And that’s exactly what we’re doing. 1. God may have you address some of the same topics with your students as the youth worker down the street. Action item: Have conversations with local youth workers to see if you recognize any themes or patterns. 2. I’m not immune to jealousy, pride, or a competitive spirit when it comes to ministry. My hunch is that you aren’t either. Action item: Ask God to search your heart and point out where you might struggle with these things. 3. God may already be at work around you and you need to recognize it. Action item: Don’t believe the lie that you need to try to start a movement. You might need to join one. You can quote me on that! 1 Comments Published by Terrace Crawford on 9/14/11 at 8:07 AM. There has been a lot of talk over the last couple years about 'extended adolescence.' It's become a bit of a phenomena because adolescence, at least in the U.S., seems to extend to around age 30. This, of course, leaves youth workers wondering about the implications in youth ministry. I am excited to announce that my friends, Mark Oestreicher and Adam McLane (of the Youth Cartel), have created an event to explore this conversation. 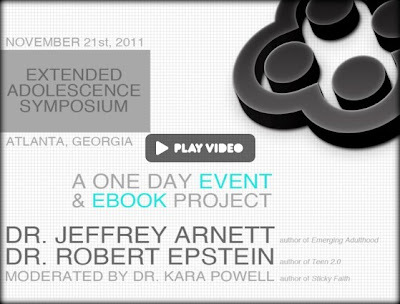 It's a one-day symposium that will be held the day after the National Youth Workers Convention in Atlanta in November... and they've invited a few people to speak on this topic (Dr. Jeffrey Arnett, Dr. Robert Epstein and Dr. Kara Powell).The Cartel created a KickStarter page to introduce this event and ask for your support. I've already backed this (put my $ where my mouth is) and ask you to join me. I'm also excited about The Middle School Campference (another wonderful offering from the Cartel), for middle school workers in October! Be sure to check this amazing 2-day event coming to Evart, MI. Registration is limited, so reserve spots for your team today!!! 1 Comments Published by Terrace Crawford on 9/12/11 at 6:16 PM. We're really challenging our students this fall to take the Bible to the extreme in their lives. Yesterday we rolled out our one month challenge, in addition to another challenge to read the Bible in just 90 days (our B90X challenge)! Just before we issued these challenges we played this video. Our students absolutely loved it. Thanks to my friends at Waters Edge who made this video. 2 Comments Published by Terrace Crawford on 9/8/11 at 7:24 AM. #001 - Students First Week: This week is our students first full week of school. I tried my best to check in with as many students as possible just after their first day just to see how things went for them. I sent texts, made phone calls, and used facebook too. Checking in with students after their first full day back to school or during their first full week is a great way to express your care for teens. If school has been underway in your area for more than a week you can still take the time (this week!) to check in with students.